You are here: Home / Reviews / Comic Book TV / The Audacity of Hope: Daredevil Season Two Review! The Audacity of Hope: Daredevil Season Two Review! Among the many conflicts left in the wake of Batman v Superman (critics vs audience, fans vs “true” fans, Zack Snyder vs the Kent family), the greatest battle is almost shockingly simple: light vs. dark. I’ve described it as grim, dour, and self-serious to the point of parody, but the less wordy summary of Batman v Superman is “dark.” Those who would deem Batman v Superman a bad movie (I’m partially among them) simultaneously have turned their noses at dark comic book stories. Give us joy, they say, celebrating the camp of Supergirl x Flash. Gives us smiles, they say, retweeting gifs of Spider-Man underoos from the upcoming Civil War. Give us hope, they say, waving a copy of All Star Superman /Man of Steel/Insert_Quality_Superman_Story_Here. What has frequently been lost in all the declarations of DC’s failure (or success depending on your point of view) is the recognition that there are many shades of dark, and not all of them are flawed. 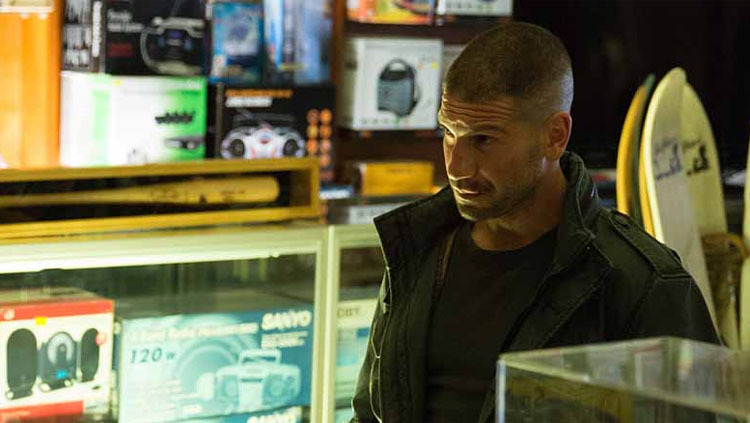 “We need heroes,” Matt Murdock implores during the mid-season Trial of the Punisher. The speech is fraught with complications. Matt Murdock is pleading his case – a case for his vigilante life – as much as he’s pleading for the jury to express empathy towards Frank Castle. At the same time, we know Matt is acting egregiously unheroic towards his closest friends, Karen Page and Foggy Nelson, his law firm cohorts who he’s abandoned without excuse during their greatest trial. The line stings Daredevil without even realizing its target, but the complexity is highlighted brilliantly in that quick exchange. Here’s a show that understands the value of heroes, the hope that they represent, but also acknowledges the difficulties of their lives, and the consequences of their actions. What does it mean to be a hero? We see several varieties, all with their own blend of failings and values. The Punisher is an unstoppable serial murderer with a code, Elektra is a viciously violent eccentric with a deep-seated desire to do something worthwhile, and Daredevil is an unwaveringly stubborn man trying to live a private and public life as a hero. Despite their differences, all three Marvel characters behave heroically at times. Daredevil oscillates between a tender, budding romance in the rain with Karen Page and punishingly pugilistic battles with Hand ninjas. Daredevil shares memories with Foggy Nelson at Josie’s bar, and mere episodes later abandons him so thoroughly that Nelson & Murdock implodes. In short: Light and Dark. Daredevil season two is remarkably dark, with gruesome violence enough between Punisher and Elektra to earn an R-rating it will never receive. Wonderfully, though, that’s just one facet of the show. Perhaps it’s in respect to Daredevil’s sensitive ears, but season two plays multiple tones throughout, whereas Batman v Superman plays a one note dirge for two and a half hours. The show’s final battle illuminates this dual tonality exceptionally well. Daredevil loses the woman he loves, followed by Punisher sniping Hand ninjas and Daredevil going Wolverine-berserker mode on Nobu and his band of Handjas. After Daredevil flips Nobu off a roof (cracking open his no killing code only for the special occasion of Nobu), Nobu appears to have resurrected instantly, once again, as any dutiful Handja will. Then Stick reappears out of nowhere, and cuts him down with a snappy one-liner. Dark, and a bit funny. Prior to this season of Daredevil, I rated every live action TV show since 2010. Despite my love of Daredevil’s first season, I placed it third on my list, behind Jessica Jones (#1) and iZombie (#2). Season two certainly complicates matters. There’s no doubt in my mind that Daredevil season two enhances the entire Daredevil package, which is a feat worth celebrating. Keeping a good thing going is the biggest challenge of any television, just ask Heroes, Walking Dead, or Dexter. Daredevil season two raises the stakes, incorporates a variety of new Marvel Universe elements, and somehow sticks the landing. For me this doesn’t outrank season one’s successful launch of the entire Marvel Netflix MCU expansion, as that established the boundaries, quality, and consistency of the entire Defenders line. Nonetheless, pulling off Punisher, Elektra, and The Hand in 13 episodes is one helluva great accomplishment. So given the two seasons of continued excellence, can I make a case for Daredevil as the best Comic Book TV show since 2010? 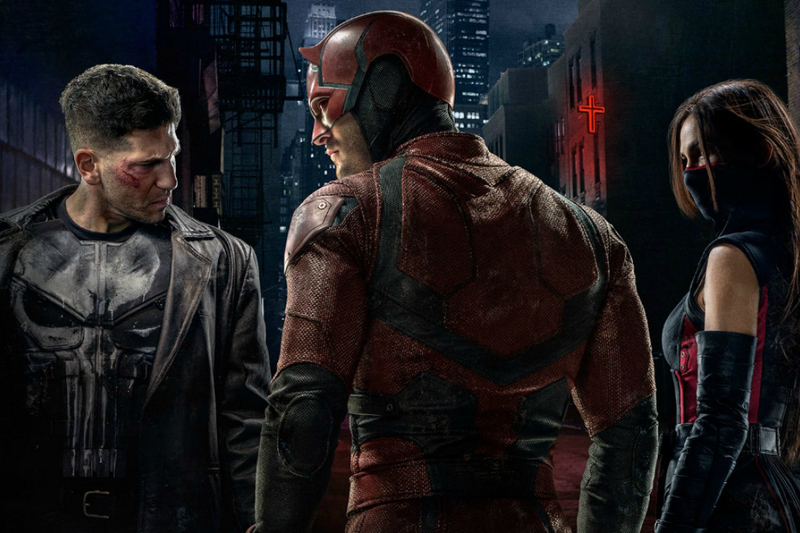 Here’s where I net out: Daredevil season two is the best COMIC BOOK TV show of the decade. Period. Nothing captures the spirit of the Marvel Universe and the comic book page like the Punisher and Kingpin duking it out in Cell Block D, or Daredevil and Elektra fighting Handjas in a sewer. That said, I’d still maintain that Jessica Jones is the best television of the lot. What Jessica Jones offers (and iZombie to a lesser degree) is the ability to transcend comics. You don’t need to be a comic book fan to enjoy Jessica Jones and find it a rewarding and insightful 13 hours. I wouldn’t limit Daredevil strictly to comic book fans, of course, but throwing billy clubs at ninjas certainly appeals to a core element of comic book action that limits its range (through no fault of Melvin Potter’s design). Long analysis short: Jessica Jones retains the top spot, but know this Ms. Jones: The pressure for season two is ON. 1) Daredevil spending 12 episodes reminding anyone and everyone that killing is WRONG came at exactly the right time, and is exactly why his “We need heroes” line resonated so strongly. It’s easy to become so enamored with the righteous vengeance of the Punisher that killing is celebrated. Believe me, I got out of my seat and APPLAUDED following the Frank’s Prison hallway massacre. I’m as guilty as anyone, it’s a very human response for a lot of viewers. I get it. And that’s why it’s so damn nice to see a hero unapologetically refuse to kill. Comic book fans frequently cave to this pressure, giving guys like Superman and Daredevil “Weenie of the Week” awards, and screaming at Batman to just go and KILL THE JOKER already. For twelve episodes, Daredevil refused to cave to this pressure, and did everything he could to prevent the attitude in everyone around him. Job well done. 2) Yes, I’m completely ignoring Daredevil tossing Nobu off a roof like Galileo dropped the orange. I’m just pretending that didn’t happen and, you know, ruin the entire previous point. 3) I love the supporting characters in this show so much. I’ve rarely enjoyed Franklin “Foggy” Nelson this much (Frank Miller’s “Guts Nelson” excluded), and I’ve never had reason to think this highly of Karen Page. Both characters are strong, particularly Karen Page, who quickly expands beyond romantic interest and carves out her own truth. 4) On that same note, I sure hope the Daredevil season three creators don’t pick up a copy of Daredevil: Born Again before production. I like “Born Again,” but we do NOT need those same “hey look it’s the real world!” elements brought to Karen’s character in this show. Karen’s had multiple attempts on her life, witnessed gruesome crimes, and had her mentor murdered by the Kingpin. She’s real enough without completely bottoming out. 5) On that same note’s note, given the dissolution of their friendship might a surrogate “Born Again” addict be found in Guts Nelson? 7) Punisher. Walk off Home Run. I got chills as he crossed home plate. 8) Elektra. Single and a stolen base, swinging wildly, and completely winning me over through sheer recklessness. 9) Stick. Ground ball double, should have been a single. 10) Kingpin. Grand Slam, ball landed on the Wrigley Field scoreboard, and he was playing in Fenway. Let me just say that I thoroughly enjoyed DDs2, thought it was ambitious and delivered a solid hit. I agree comic fans probably think it’s better, non-comic fans probably prefer JJ. That being said, I just want to express that I REALLY want to see the Elektra from Frank Miller’s Elektra Assassin portrayed on screen. I’m keeping my fingers crossed that’s what we’ll see in DDs3 or Defenders, that the Black Sky Elektra will be beyond a ninja. Excellent review Dave, really good points throughout. I agree that Jessica Jones is probably better but the first four episodes of Daredevil season two just resonate so strongly for me that they kind of override any weaknesses in the rest of the season. That first arc leaves a powerful enough impression to justify ranking this season even above Alias/JJ. Just fantastic TV from Marvel right now considering the Netflix shows have been better than I’d ever hoped and Agents of SHIELD has somehow become great after stumbling badly out of the gate. As enjoyable as Flash and even Supergirl are, I think Marvel has set a very high standard for great comic book adaptations on television. Here’s hoping they can keep it up and don’t end up diluting quality by adding things like Cloak and Dagger too quickly or forcing spin-offs like Most Wanted. I think there are plenty of new characters and stories they can adapt, like using Punisher or adding Damage Control. But I am a bit concerned about whether or not they’ve really developed the storylines necessary to support shows like Most Wanted or even the Defenders. Thanks for the article, I really enjoyed it. I share your concerns with Most Wanted, and a bit with Cloak and Dagger. All these expansions certainly have potential, but you do run the risk of spreading too thin. For all of the ‘comic book movies are taking over!’ talk, Marvel has shown surprising restraint. But you’re right, Netflix Marvel sets a high bar, and I’m hoping these additions can strive for those heights. great review! I felt like season 2 of Daredevil just edged out Jessica Jones. The Punisher and Elektra added this element of intrigue and excitement that made me wonder if they could’ve upped Daredevil’s development more this season. Thanks! DD S2 certainly makes a run at Jessica Jones, and that’s no small feat.